For this recipe, we reach back to a kitchen device that reminds many people of horror stories of the seventies. Some incidents with exploding pressure cookers (mostly caused by improper use) meant that most would not go near it. Professional chefs discarded pressure cooking as 'something for canned food'. 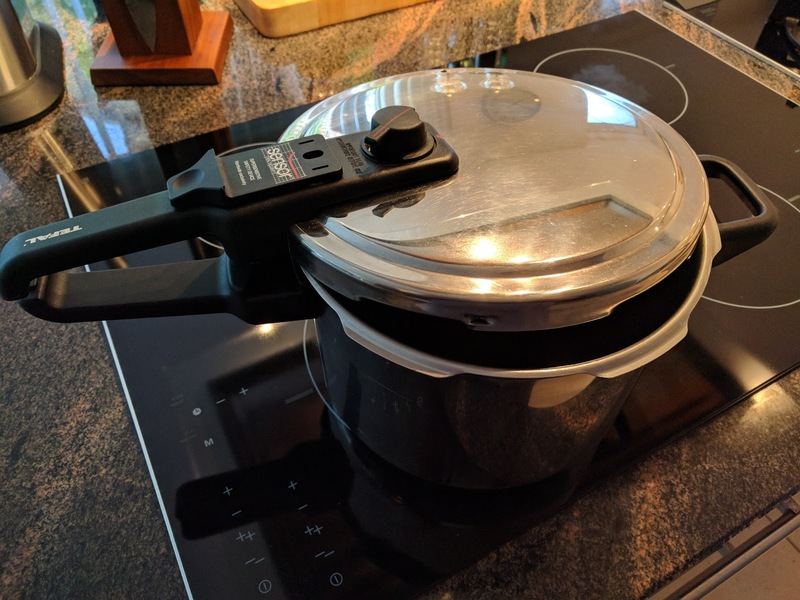 In the meantime, technology has made progress and pressure cookers have become almost 100% foolproof. Even if you would try to open them while pressurized, modern pressure cookers will not allow you to do that. 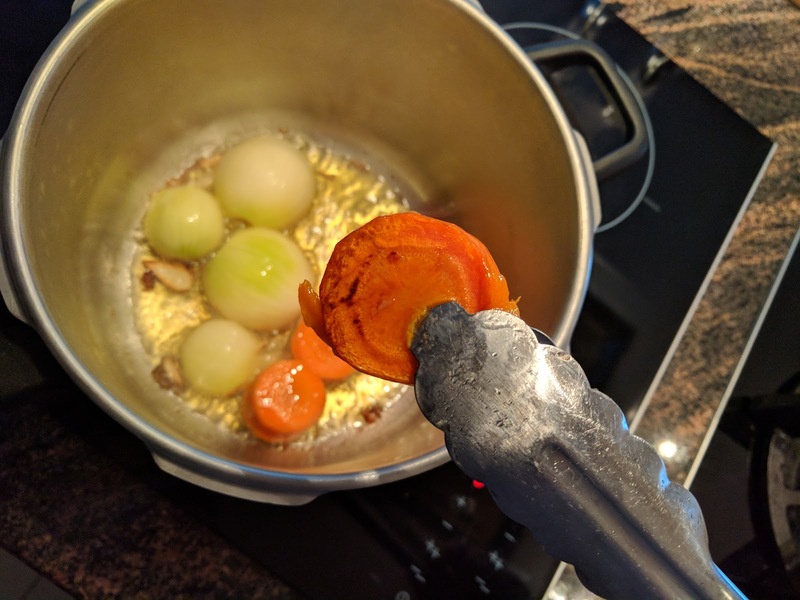 Slowly but surely, restaurant chefs are discovering the benefits of this method as it not only shortens cooking times tremendously, but also locks in flavors that would otherwise evaporate or disappear down the drain with the cooking water. 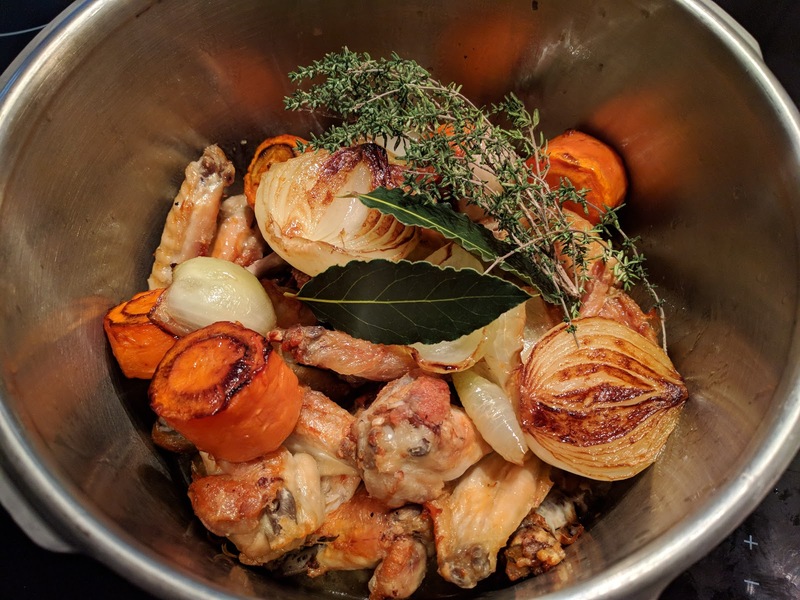 One of our favorite pressure cooker recipes is for brown chicken stock. Super easy to make and much faster than the classic way of doing it. You'll find we use considerably less ingredients than the classic stock because the pressure cooker intensifies the flavors. 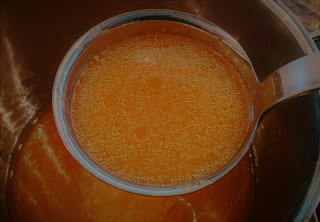 As the liquid in the pressure cooker never really boils, the resulting stock is remarkably clear and tastes very clean. For brown stock, preferably bones and carcasses or any other pieces that would normally be discarded are used. You can collect them in your freezer every time you have chicken until you have enough to cook a batch of stock. 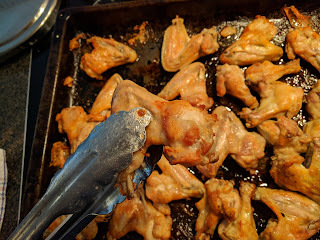 Alternatively, you can use chicken wings or legs which are available in most supermarkets. We find they have the ideal ratio of meat and bones to give both flavor and collagen to the stock. Preheat your oven to 180°C. 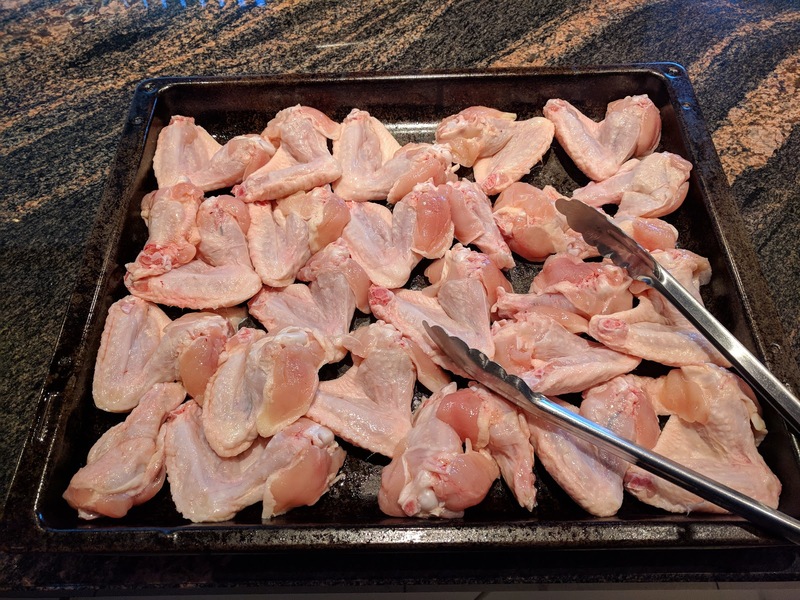 Place the chicken wings on a backing tray and lightly cover with some neutral cooking oil. Do not add any salt or pepper. 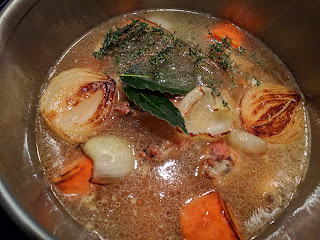 Our stock is a base without any overpowering flavors - salt and spices are added later. Bake until nicely caramelized, approx. 30 min. Turn halfway through cooking time. While the chicken is browning, put your pressure cooker on medium-high heat. Add 2 tablespoons of neutral cooking oil (no olive oil!) and sauté your vegetables until nice and caramelized. Remove from the pan and set aside. Discard the cooking oil, but leave the fond on the bottom of the pan untouched. 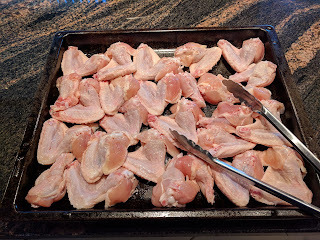 Once your chicken is nicely browned, remove from the oven and add to the pan, along with the vegetables, bay leaves and thyme. 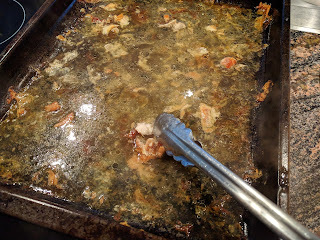 Remove all fat from the backing tray. Add 2 cups of water and scrape as much of the goodness from the backing tray as you can. 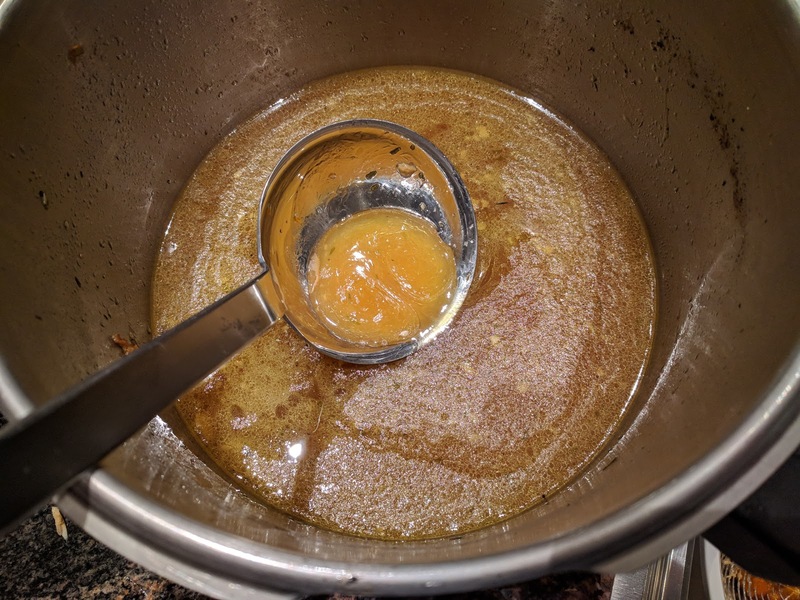 Put scraps and water into the pressure cooker. This is where a lot of the flavor is! Fill with cold water until everything is barely covered. Max. 3 liters. 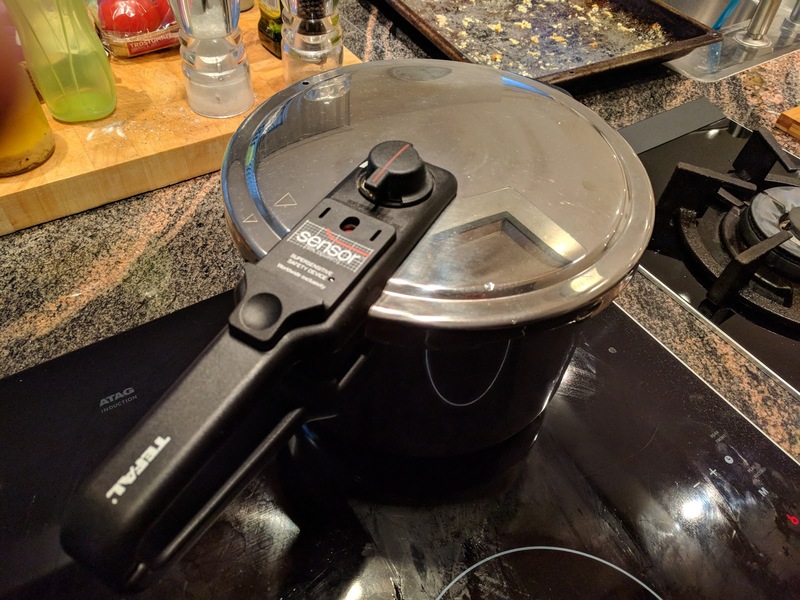 Important safety tip: never fill your pressure cooker for more than 2/3rds of its capacity. Close the lid carefully, making sure the gasket is in place. Pressurize quickly over high heat, then back down to desired cooking temperature as described in your pressure cooker manual. Cook the stock for 90 minutes.This somewhat longer cooking time is needed to break down the solidified proteins in the roasted chicken. 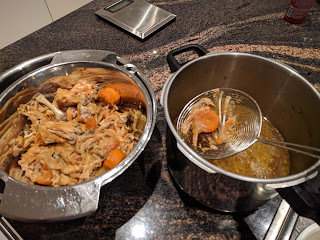 Still... it is much less than 3-4 hours for the classic brown chicken stock. At the end of the cooking time, leave the cooker to depressurize naturally or cool the pan under a running tap. Do not open the steam valve, as this would cause the stock to boil and turn it cloudy. Optional step is to remove all fat that comes to the surface when the stock cools down but remember the fat is where a lot of the flavor is. You can also strain the stock when moving it to another container to cool down. You can see how the stock was already thickening while still warm in the pot. This is caused by the high level of gelatin coming from the chicken wings and the concentration of the liquid. And there you have it: just under 2 liters of glorious, intensely flavored dark chicken stock. It will keep in the fridge for a week or in the freezer for half a year. 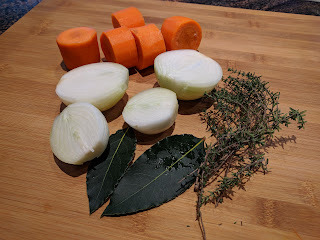 Add seasoning for a clear broth or use as base for your chicken soup, risotto, sauces, demi-glace, etc. etc. 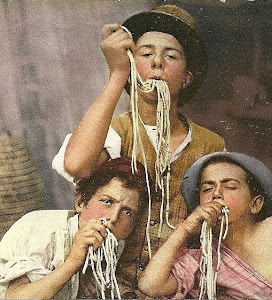 © Discover Great Taste 2012 - All non proprietary images are believed to be in the public domain. Watermark theme. Powered by Blogger.